I invite you to think of the most successful businesses’ or genius’ inventions. Do you think they got lucky on the first try, or do you think they were so hungry for success that they didn’t let failure stop them? To reiterate my point, check out the facts below. Although failure is inevitable, it does not prevent success. The most important character trait of a leader is their refusal to give up on their goals. 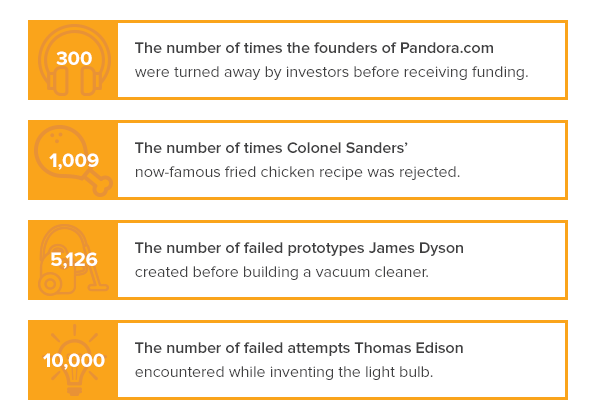 If Thomas Edison gave up after 10, 100, or even 1,000 times, our world would look a lot different and maybe darker. When you let your commitment to your outcome drive you, and your business, you will truly know what it means to feel proud. What are you hungry for? What decision can you make today to get you closer to the results you desire for your business?